pool. Satellite TV, DVD, fireplace, A/C, electronic safe and now with free WiFi! Within walking distance or short driving distance will take you to Falesia Beach, an endless and peaceful beach in Vilamoura. It is located close the marina with famous shops, bars, restaurants, casino and disco clubs. Surrounded by golf courses. To enhance the experience of your holidays the Villa boasts 2 bicycles so you can cycling in Vilamoura! It is a private family holiday house perfect for your holidays! Sleeps 8/10. 4 bedroom, wonderful, south facing villa with private pool, deck, beautiful sunny garden and cosy atmosphere. Air-conditioned. Quiet location next to Old Village, Four Seasons, Hilton and Pinhal Golf Course. Everything is within walking distance or short driving distance including beach, marina, golfs, shops, bars, casino, restaurants, and supermarket. 20 minute drive to Faro airport. Albufeira 25 minutes drive. Perfect holiday house for your family holidays! I´m an architect working and living in Lisbon. This Villa is where I spend my family holidays and where I go always to have a break. This Villa was restyled to be used in our family holidays. We tried to put into this Villa beauty and comfort enough to relax in our holidays. Now we also want to share it with you! 1 en-suite bathroom, with separate toilet and large shower. 1 en-suite bathroom, with large shower. 1 shared bathroom with large shower, toilet and bidet. 1 social bathroom. Sleeps 8/10. 4 bedroom, wonderful, south facing villa with private heated pool, deck, beautiful sunny garden and cosy atmosphere. Air-conditioned. Quiet location next to Old Village, Four Seasons, Hilton and Pinhal Golf Course. Everything is within walking distance or short driving distance including beach, marina, golfs, shops, bars, casino, restaurants, and supermarket. 20 minute drive to Faro airport. Albufeira 25 minutes drive. Perfect holiday house for your family holidays! Suitable for people with mobility problems as the ground-level is 100% accessible (without stairs) with kitchen, living and en-suite bedroom. South facing, sunny and intimate garden with private pool (changing colour light), deck terrace. Large wood table with umbrella and chairs in the patio alfresco dining with built-in barbecue. Sun loungers with cushions. Totally fenced garden. Lockable entrance gates. Firstly I have been booking private villas for almost 30 years and Filipe is by far the best owner I have ever dealt with, he always responds immediately to any question or problem. As an example we couldn’t operate an air con unit in the Villa for a bedroom where a baby was sleeping, I sent him a WhatsApp message and he was on the phone within moments to talk me through it, now that is service. He was extremely accommodating with regard to checking in and checking out times. We were a two group party, one group of 4 adults with a 6 month old baby and a 16 month old baby who flew into Faro mid morning & were leaving early evening. With the check in time being 4pm & check out 10am this would have meant they had to have all the baby equipment with them all day, not ideal. An e mail to Filipe and he arranged for all the luggage to be left in a secure area within the Villa before check in and after. The Villa itself is lovely, we opted for the pool heating option and although it was early April we did use the pool even though it was still a little chilly. The wooden decking at the side of the pool needs some attention as there are some loose screws sticking up which for toddlers is a hazard, but there are shaded areas to stay out of the sun. The kitchen is very well equipped and the bedrooms and bathrooms very good. All in all we had a wonderful stay. Thank you Filipe and Ms Paula for your help & consideration. We were a group of 4 ladies staying in the villa. We were playing in a golf competition at Vilamoura and the location of the villa was just perfect to get to the courses we were playing. The villa had everything you wanted, We each had a bedroom each. The open plan area of the downstairs was great. We didn't have time to use the pool but looked great. Paula the cleaner was very attentive and kept the villa clean. She doesn't speak English but owner translate for us. Owner Phillipe was very pleasant and genuine ,We would love to return. Just returned from a week at Panama House. The villa is really beautiful, inside and out, and as nice as the pictures suggest. It was very spacious and well appointed with an outdoor cooking and dining area and the pool was lovely too (unfortunately the weather in mid-October wasn't as hot as we'd hoped every day to take full advantage of it) - in high summer it would be fantastic. The location is in a quiet neighbourhood and not far from the centre of Vilamoura. Communications with Filipe were very fast and we never had any issues throughout our stay - thoroughly recommended! Beautiful villa in a stunning location!! Myself, partner, children & mum (party of 8) have had a wonderful time at Panama house, Villamoura. The villa is in a very quiet & beautiful area. We did rely on Uber taxis to get us around ie supermarkets & to the marina but Uber works very well & is very cheap. This was our first visit to Portugal & we will definitely return, hopefully to the same villa. Filipe, the owner of the villa is superb. Always happy to help with any queries before & during our stay. Vilamoura is considered one of the best resorts in Europe. 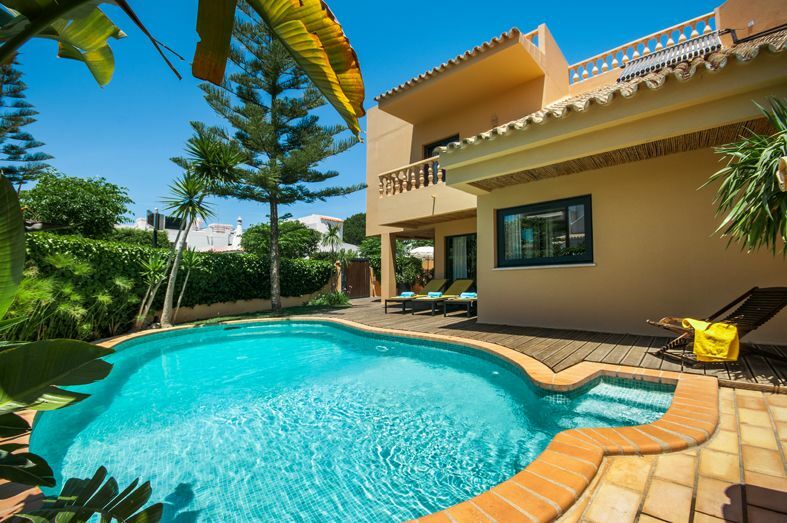 Panama House is in a quiet location next to Old Village, Four Seasons, Hilton and Pinhal Golf Course. Everything is within walking distance or short driving distance including beach, marina, golfs, shops, bars, casino, restaurants, and supermarket. A car is not essential, unless you want to explore the surrounding area. There are plenty of bars and restaurants in the immediate area. The mini train stops very close to the villa. Bicycle hire available locally. A very well stocked supermarket is in the Old Village area which is minutes walk from the villa. Vilamoura's beautiful international yachting marina is a leisurely 20 minutes walk away with a variety of excellent restaurants, first class shopping and a casino. A variety of leisure activities are available such as water parks, Zoo Marine, Jeep safaris and sailing trips. Taxis are reasonable. Golf: The villa is within walking distance of the Pinhal Golf Course (5 minutes). The Old Course, Laguna, Millennium and Vila Sol courses are within 5/10 minutes driving distance. This area is one of the Algarve's most famous destinations for practising golf, here we can find the most spectacular and iconic landscapes while we are playing golf. Prices shown are for the property per week in Euro. We accept payments in GBP. Discounts for long winter periods.